Builders use pre-installed or post-installed installed anchorage systems to attach metal studs to concrete and masonry surfaces. 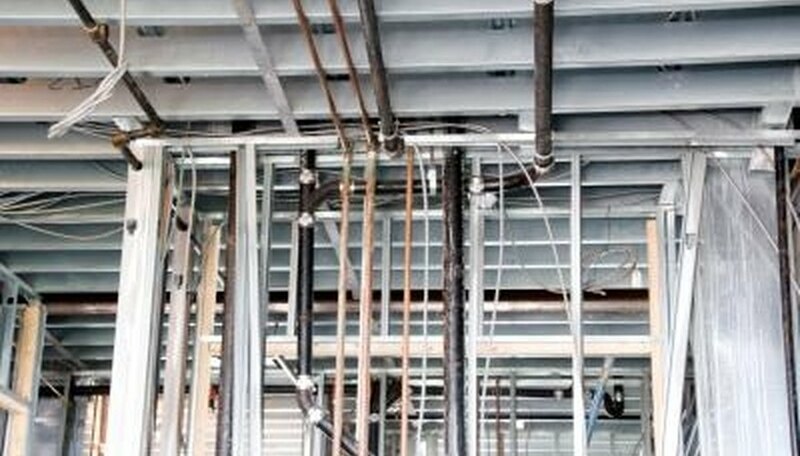 Whereas the term pre-installed refers to anchors that are placed into wet concrete, the term post-installed refers to anchors that are fastened to concrete after the concrete following hardening. Do-it-yourselfers commonly install metal studs as interior partition walls and use self-tapping concrete screws to fasten the metal stud track to the concrete surface. Mark the position of the screw holes on the interior of the metal stud track with a pencil. Although spacing specifications vary, tracks generally receive two screws at each end one screw every sixteen inches between the ends. Stagger the location of the screws between the ends, meaning alternate their location from left to right. Attach a metal-boring drill bit to the drill. Drill through each of the screw hole marks. Place the stud track on concrete floor and position the track in the desired location. Press a pencil through the holes in the track to mark the location of screw holes directly on the concrete slab. Remove the track from the floor. Remove the metal-boring drill bit from the drill and replace it with a masonry bit. Wrap a piece of electrical tape around the shank of the masonry bit to indicate the depth of the hole; the depth of the hole must equal to exceed the length of the screw's shank. Bore a hole into concrete floor at each of the screw hole marks, stopping when the electrical tape meets the level of the floor. Blow into the holes to remove concrete dust. Remove the masonry drill bit from the drill and replace it with a driver drill bit. Place the stud track on the concrete floor and position the track's pre-drilled holes over the holes drilled into the concrete. Mount a screw onto the drill bit. Place the screw's tip through the track and into the hole. Drive the screw into the hole until its head holds the track against the concrete. Drive a concrete screw into each hole until the metal stud track is fully secured to the concrete. If you'd rather not blow concrete dust out of holes, use a thin pipe cleaner or a blast of air from an air compressor.